Blackberry Thumb? Did None Of These People Play Video Games?! 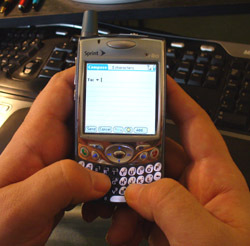 Home » Archive » Blackberry Thumb? Did None Of These People Play Video Games?! The scare of worker’s compensation claims because of overuse injuries relating to texting and emailing with Blackberrys provided by your employer sounds like a trumped up charge to me. Did none of these adults play Intellivision when they were kids? Are they not playing Nintendo DS games now? Intellivision Thumb was around a lot longer than Blackberry Thumb. Maybe it’s not all Blackberry’s fault. When I worked in a busy office processing claims, I was amazed at the carpal tunnel claims from one woman in our office. She wore braces, had a special desk and they even moved her to a position that had less typing and data entry. One day, we were just shooting the breeze and I asked her what she did for fun. She knitted. She was so happy to know someone else who knitted that she started showing me her projects. That carpal tunnel syndrome was caused by knitting, NOT data entry. If worker’s compensation claims are being made on Blackberry Thumb, it would be wise to find out how much other gaming the employee is doing and has done in the past. It might turn out to be a bad case of Intellivision Thumb instead. As always, remember, if you are having hand pain from ANY gadget, lay off for a while. Take breaks. I know the game is REALLY fun, but you need to take a break if you want to use those fingers for anything else. Same goes for you Crackberry Addicts. That email will wait until you can get to the computer, I promise. I know the game is REALLY fun, but you need to take a break if you want to use those fingers for anything else.